A Message from Annie and her family. The mission of the Annie Moses Foundation is to empower a new generation of young artists with the excellence and spiritual integrity to transform our world for Christ. By training young people to command a stage and communicate virtue with beauty and excellence, we are creating a space in our society where truth can flourish. Instructors taught at the finest musical conservatories including The Juilliard School, Cincinnati Conservatory, Belmont University, Elon University, and the New England Conservatory of Music. Outstanding performance opportunities at venues like The Grand Ole Opry House, The Country Music Hall of Fame and Museum, Bluebird Cafe, and The Factory in Franklin TN. Original programs that are customized and arranged to maximize the individual talents and skills of the players who attend. High-caliber mentors who focus in on each student, offering both musical instruction and a godly influence. The Conservatory of Annie Moses is the premier music program of Annie Moses Foundation. Its purpose is to Develop, Disciple, and Debut a new generation in the highest forms of musicianship and artistry, coupled with a Christian vision of the arts for the glory of God. Stylistically diverse, the Conservatory teaches the best of classical technique alongside the charismatic performance skills needed as a modern musician. 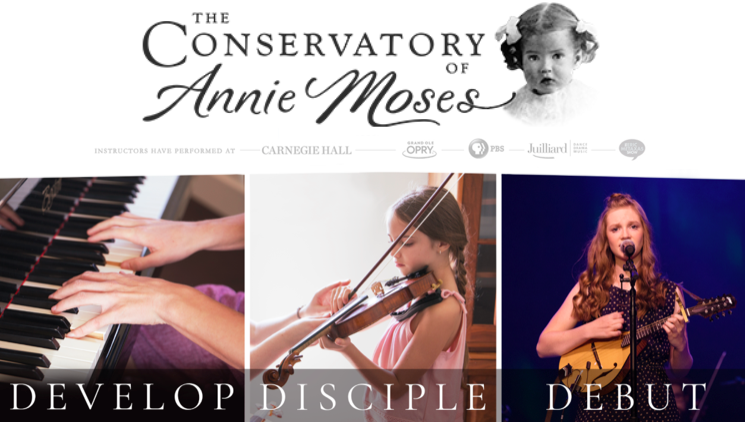 The Conservatory of Annie Moses offers an exclusive, holistic and faith-based methodology developing complete musical fluency in budding, young artists. To empower families in the artistic nurturing of their children. To offer a streamlined, holistic methodology designed to lead a child from the practice room to the performance hall. To disciple a child who is rooted in the truth of God and possesses the performance skills to proclaim that truth with excellence. To equip families to make music together. The Conservatory of Annie Moses teaches classical technique with a commercial music application through a Christian-faith lens, and features a pre-professional, artist-mentor program..
To groom a new generation of godly young artists who can “play skillfully” and occupy the world of the arts for the glory of God. Give the Gift of Excellence - Donate Now. Our mission is to reclaim our culture through a spiritual vision for the arts. When we began touring as the Annie Moses Band over fifteen years ago, we wanted to make great music that expressed our love for God and our love for each other. But as we toured, our vision grew. We came to recognize that the world of arts and entertainment is both tremendously powerful and deeply troubling. Today destructive images and messages pollute the hearts and minds of our families on innumerable technological platforms. Each year massive corporations release yet another wave of albums, films, and television programs that glamorize darkness and preach decadence. At the same time, arts education has become politicized and anemic. College programs leave hundreds of aspiring performers with modest skill, mountains of debt and no visible pathway to a career. Imagine a world where moral integrity and artistic excellence filled the stages of Broadway and the screens of Hollywood, a world where every genre of music flourished through outstanding local talent rooted in a love of God and a love of family. This is the world Annie Moses Foundation is making a reality. - first, by developing and supporting exceptional creative projects that promote a Christian vision of life and the human family. - second, through a series of faith-based educational programs designed to lead young performers from unskilled study to professional life. Too often our efforts in the arts follow the glamour of celebrity. But the true opportunity lies in our children and local communities, raising up a new generation of skilled artists who are committed to truth, beauty and goodness.